There is a scene late in Batman Returns, which was Michael Keaton’s last superhero film, when Batman glides over Gotham City. Director Tim Burton employed a God’s eye view as the Caped Crusader rises from the bottom of the frame and crosses over the top in perfect form. Alejandro González Iñárritu presents a similar shot in Birdman or (The Unexpected Virtue of Ignorance) when Keaton, playing a has-been Hollywood actor whose claim to fame was a superhero not unlike Batman, imagines himself flying over New York City. It’s safe to assume the similarity between Burton’s shot and Iñárritu’s is no coincidence. Keaton was cast in the lead role of Birdman for a reason, not least because his post-Batman career may partly mirror that of the character he plays. But the idea that the two have anything in common fortunately only adds to the appeal of Iñárritu’s film; it doesn’t determine it. 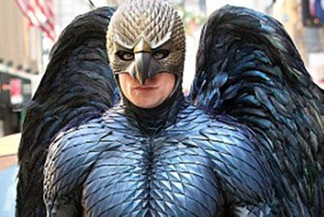 Birdman would be just as sad, humorous and lively without the audience knowing Keaton once played a superhero himself. His character and performance, and the film as a whole, are engaging regardless. Keaton plays Riggan Thompson, who identifies himself as an actor but whom critics label a celebrity. Riggan once played the title character in a superhero franchise called Birdman, which was a huge hit, but now, years later, he finds himself struggling to do something (and be someone) that matters. He explains this is why he turned down Birdman 4. To reinvigorate his career, Riggan is funding, directing and starring in a stage adaptation of Raymond Carver’s What We Talk About When We Talk About Love on Broadway. Birdman functions not only as a character study of Riggan, who’s desperate to reassemble the shattered pieces of his current life, but as an ensemble and often zany comedy about a play that seems destined to fail. Neither one of these premises is particularly groundbreaking. There have already been movies about once-famous Hollywood actors who now feel they’ve drifted into obscurity (Sunset Boulevard, Somewhere), and about the behind-the-scenes shenanigans of a tumultuous stage production (Topsy-Turvy, Shakespeare in Love). These recycled setups are perhaps what hold Birdman back from total greatness, but together they still make for an engrossing and thoroughly enjoyable experience. Much of this is owed to Iñárritu’s technique of making it seem like the entire film was shot in one take, which raises the energy and tension levels and we get the sense something or someone is always about to burst. Whether or not something actually does, I’ll let you discover, but this approach keeps us on edge and we instantly get caught up in the characters and their absurd situations.